The Planar 3 features a glass platter and probably the best inexpensive straight line tone arm in the industry - the RB-300 tone arm. The RB-300 is so good it does justice to tables costing thousands of dollars. The arm eliminates the faults of cheaper tonearms through its one-piece, resonant damped design (no separate head shell to blur sound) and high quality ball-and-gimbal bearing pivot, and includes a damped cuing lever. The belt-drive Rega comes complete with felt platter mat and dust cover. Made in U.K. Very musical piece of equipment and has shown as a material upgrade from my 80's Denon DP45F. Setup took a little time as I was retro-fitting it with my original Shure V15VMR cartridge and a tonearm lifter was needed and it took a little time to get the cartridge properly aligned as it does not have the center screw like some of the newer models. Detail is fantastic and it makes every piece of vinyl, even those purchased cheaply at a thrift store, sound better than I would have expected. I purchased this piece of equipment without a cartridge so I don't know about the performance with the Elys cartridge. In reading what others have written here, I wonder what your total setup is relative to complaints about the sound. Like any turntable, the quality of the sound is highly dependent on the cartridge and then the phono stage you're putting it into. The Shure is one of the better cartridges ever made and I have this paired with an older Mcintosh MA6100 integrated amplifier. If you're using a lower grade phono stage or low quality receiver, then you're going to get what you get. At $700, this is a lot of performance. The only weakness is that I wish it was semi-auto so that I wouldn't have to hop up at the end of the album to lift the stylus off the vinyl. Planar 3 (2016): Good tonearm. Very musical. Nice looking. Build quality is not on pair with the asked price. With Elys 2 the sound is closed in, lacking in airiness and details. My Pro-ject Debut Carbon Esprit DC with Denon DL-110 sounds better than the Planar 3/Elys 2 combination. QC is below average. P3 was purchased based on so many positive reviews here and in many audio publications. I was not very impressed with the quality of sound came out of this cheap looking TT. I returned it three weeks later and got my money back. Glad I still had my Systemdecl IIX, which I used for many years, buy that instead of this Rega, Systemdeck is way ahead of Rega and performs much better then it's price would indicate. this review is trailing the other reviews by years however in the event somebody researches the P3 and wants feedback from a dedicated audio listener with decent equipment and it is in plain speak (no offense to audiophiles who are better versed technically). I have spent approximately $40,000 to end up with this $12000 system. Tried B&W 803S, B&W 805D, KEF's, Dynaudio (awful! ), Bryston, W4S, Peachtree.It depends on chemistry I know. The current setup is the best match for the P3. I use a Sumiko Pearl basic M cartridge. The turntable sounds sweet. It did not at first. It sounded reserved and compressed at first. There was no comparison to digital. Expecting warm but sounded dull. Then everything opened up after awhile. Also at this point warmth came upon the player and digital sounded harsh Of course both formats largely depended on the recordings. However I never heard any of the wow and flutter or interference/noise that others have complained about. None of it. There are no mods to my table. This is a solid turntable. I am now toying with the idea of the Clearaudio Concept because I am so wowed by the performance of the Nano (used). I previously had a NAD phono preamp and it was junk. However I do not think I am going to abandon this P3. i believe the chemistry is set and the risk is that I acquire a technically better piece of equipment but in concert with the other parts it may sound inferior. Last point and I believe a critical one. When I acquired the Bryston single channel amps and the NAD Masters series processor I had my audio dealer come out and setup the entire system. It cost me $400.00. I believe that the dealer service in optimizing the system especially the calibration of the Rega P3 has a significant role in how well this unit sounds despite the fact that I have changes all of the other pieces with the exception of the Rega. Great investment. Value for money. Never fails in its performance. I would never give-up my P3 for any other models within its range of budget. This is my review of the Rega Planar 3. Like many people I read the reports in the Hi Fi press about the Rega turntables during the mid nineties and was interested in upgrading fom an older turntable. Although I don't listen to much vinyl now it is nice to use the Rega. It has flaws though , motor hum is present towards the centre of the platter , the original pick up wiring is not particularly good and I came up with my own mod to stop the dreadful mechanical motor lumping which came through the deck . After the recent Cadas litz rewire using my old Ortofon cartridge from my original table some years and a lubrication service of the arm and turntable bush it now sounds as I want it too. And the detail and stereo image is much improved with an extended bass. I would advise anyone that feels their Rega three sounds a bit restrained to get the Cardas kit fitted before changing anything else. It also got rid of phase distortion and a lot of extra detail came through. , very pleased now . This is a follow-up to a previous review in which I was critical of my Planar 3, which is one of the first made (in other words, my Rega is very old). I've always enjoyed the RB300 arm but have been very disappointed with the turntable itself, especially its poor shock isolation and excessive flutter-and-wow. On the advice of a friend who also owns the Rega Planar 3 (and feels the same way I do) I decided to buy the Motor Upgrade, the Limited Edition White Belt, and a new Rega platter mat (in basic black). I had no trouble installing the new motor. In fact it was i the process of doing it I discovered what made the Rega sound awful to me -- the motor mounts are small rubber bands. this causes the motor to not be rigidly enough mounted to be able to deliver power to the platter smoothly, increasing the flutter-and-wow. I'd always blamed the flutter-and-wow problem on motor torque but that's wrong -- it's the way the motor is mounted that affects flutter-and-wow. The motor upgrade mounts the motor rigidly. Along with being a better motor this rigid mounting provides rock-steady power transmission to the platter. Wonderful! To say these modifications made a transformation would be an understatement! Honestly, it's like a new turntable! The flutter-and-wow is now excellent, music has a speed and pace I've seldom experienced before (and never with my Rega as it was previously), the drive is dead quiet so music springs from silence. I now love this turntable! I've noticed a few snarky comments made by other reviewers stating that if you dislike the Rega the problem is other equipment you have, not the Rega. This is insulting as it assumes you cannot discern where the sonic problems are occurring. If only one component in an otherwise excellent system sounds bad to you, then the problem is that one component, even if that component is the beloved Rega Planar 3. That having been said, let me address those who "bash" the Rega: you're right to be critical of it. But I'd ask you this question: How old is your Rega Planar 3? Rega has improved it over the many years they've been making it. 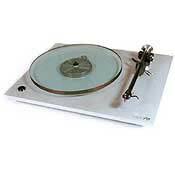 My Rega Planar 3 was one of the first ones sold in the USA. If your Planar 3 is more than 5 years old and you're not happy with the sound, buy the upgraded motor upgrade, if possible buy the belt, replace the mat -- then sit back and enjoy one of the best sounding vinyl experiences you will ever have! These few upgrades are far cheaper than buying a new turntable. IF you don't want to buy the upgrades but want better sound from the Rega, replace the motor shock mounts, as they've probably dried out too much over the years. But really, I cannot emphasize too much how the new motor upgrade and limited edition belt transformed my older Rega Planar 3's sound from awful to delightful! RB-600 tonearm and Denon DL103 Cartridge. The motor runs extremely quiet. Speed accuracy is right on(stock motor) and I have never had any hum or wow/flutter issues. Mine sits on a target wall mount shelf. If yours is sitting on the top of a stereo rack, I am sure this table, as anything other than megabuck tables, will have wow and flutter issues from floor vibrations. I chose this table over the much touted music hall MMF5 and 7 and the project xpression 1&3. It just sounds RIGHT!!! The Planar 3 was my first introduction to vinyl. I spent some time finding a turntable that not only would suit my pocket but one that could grow with my new found taste for records. I searched hard and eventually bought a pristine Planar 3 with RB300 and new Goldring 1012GX cartridge, however I initially had some problems with set up - the speed just seemed to be too slow. I later found out that not only had the motor pulley had not been correctly fitted (It needs a good hard push onto the motor spindle to spin at the correct RPM. ), a third party pulley had been supplied with the deck. Rega originals are the only belt to use - third party ones can put too much strain on the motor and and slow down the RPM. I bought a new Rega pulley, and everything sounded great from there on. Nirvana unplugged just never sounded so good. It is such a simple deck to use, just one button, on and off. I don't like the idea of extra circuitry for 33/45 rpm switches. On the rare occasion I play a 45 it is no real hassle to lift the platter and put the belt onto the larger pulley rung. The Planar 3 is a budget turntable at it's roots, but it has such huge potential. I started to tweak things as I began to hear some weaknesses in comparison to other decks. I bought best quality military grade coax cable, rewired the RB300 and extended the RCA leads so that I could isolate the turntable several meters away from my amp and speakers. The Planar 3 is fairly unsubstantial in weight so it can suffer badly from vibration. The answer was 12kg of granite and isolation pods. The next move was an Expressimo VTA adjuster from Elusive Disc, which with some experimenting helped balance the over-heavy bass. The addition of an Iron Audio acrylic platter finished the job, with a fuller and more coherent presentation to the music. Miles Davis' - Someday My Prince Will Come had so much more instrumental separation and depth. If you are considering getting into vinyl I wholeheartedly recommend this turntable. A true bargain and with so many third party upgrades it is possible to make substantial improvements over the standard deck.